Events in Mumbai - Cruise India The Motorbike Show from 17 to 23 February 2014 at High Street Phoenix, Lower Parel. Imagine a sea of modified choppers, a range of custom made super bikes, a live demonstration of assembling your very own mean machine coupled with all the other paraphernalia that come along with a biking festival. And what is amazing is that you get a chance to witness all this while sitting in Mumbai without having to travel all the way out of town. High Street Phoenix, Mumbai’s favorite destination centre, is all revved up to host Azure Marcomm’s first edition of The Cruise India Tour Bike Week, Mumbai’s first ever dedicated bike week from the 17th to the 23rd of February 2014. This bike week will kick-start an 8000 km rally across India for the cause of empowerment of women supported extensively by female bikers taking the entire number of participants to about 600 riders. Spread over a week with each day dedicated to one particular aspect of biking coupled with participation from bike enthusiasts, vintage bike owners, several popular biking clubs, stuntwomen, musicians and passionate bikers, The Cruise India Bike Tour Week will give Mumbai a taste of adrenalin right in the heart of the city. Every initiative has been entwined with High Street Phoenix’s regular properties ensuring cohesive brand syndication. This initiative will feature accomplished names in the biking fraternity like Urvashi Patole, Anam Hashim, Dayal Bharadwaj, industrialist Kapil Pathare and Arjun Bafna. Tuesday, 18th Feb : Make Your Own Chopper & Workshop by Adil Dumasia’s Transfigure Custom House - Transfigure Custom House (TCH) was established in January 2012, conceptualized & founded by Adil Dumasia, an ex-merchant navy officer, automobile enthusiast and a bike lover. TCH has won the 1st prize for best custom bike award at the Royal Enfield Rider Mania 2012 and runners up at Rider Mania 2013. TCH was chosen as one of the custom bike builders in the IBW 2013 Biker build-off and in the Open class build-off for IBW 2014. Friday, 21st Feb: Bikeography – A display of images and videos clicked by riders because only a passionate rider understands the zest of cruising and the thrill of his odysseys. Every biker has his own vision of the road that he passes by and he has his own expression of the ride that he lives by, at Cruise India they call it “THE BIKOGRAPHY”. 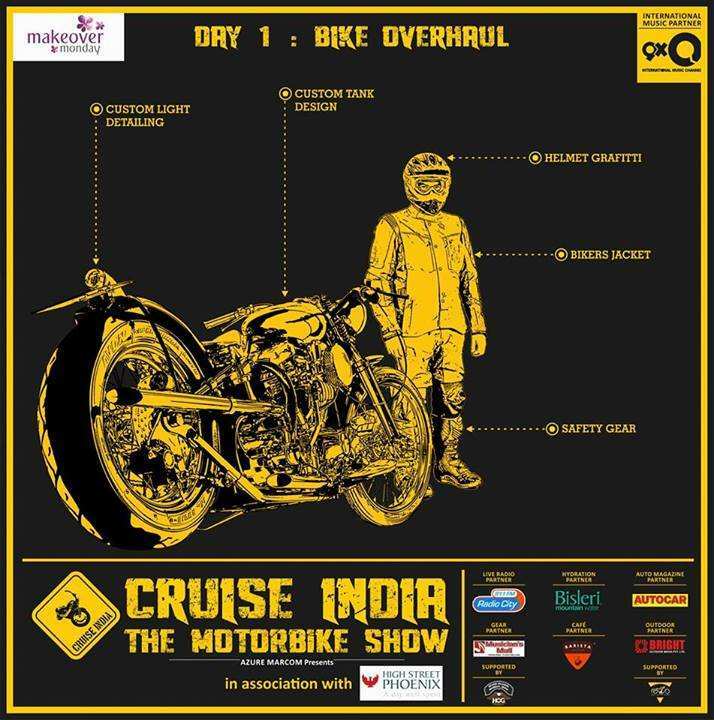 Saturday, 22nd Feb: Cruise India Weekend - This day will be solely dedicated to the display of various bike related stunts by the adrenalin pumping group “Rubber Smokin’ Angels” followed by a coterie of experienced BMX Stunt Bikers. Established in October 2003, Rubber Smoking Angels (RSA) is one of the first biker clubs of India focusing mainly into the motorcycling disciplines of Sport Riding, Stunts and Drags. RSA Stunters and Draggers have won two trophies in SpeedRun 2008 organized in Mumbai. One of the RSA members won the first place in Yamaha Racing Challenge 2009 under Expert Class organized in Mumbai while another successfully auditioned for Pulsar MTV Stuntmania Reloaded in 2009 and made it to the Final 12 Participants. RSA riders have been winners of Apache Racing Experience 2011 in 160 and 180 Racing categories and Team RSA achieved a podium finish at the Motocross Event conducted in Pune in 2010 under Indian Class category. Sunday, 23rd Feb: Cruise India Weekend - Sunday morning 9.30 am will see the flagging off of the 1500 odd riders from High Street Phoenix for the 8000 km long nationwide The Cruise India Tour for empowerment of women. The rest of the day will see a plethora of live band performances to conclude the week’s success on a musical note.